ULSTER BANK EARNED €100 million by overcharging its customers over a number of years, it was revealed today. The bank has admitted it overcharged thousands of its customers, mainly by denying tracker rates with “ambiguities” in its contracts. It has set aside a fund of €211 million to pay back the €100 million it wrongly took from customers and to compensate them for the damage caused. Two of the bank’s officials, chief financial officer Paul Stanley and head of corporate affairs Elizabeth Arnett appeared before the Oireachtas Finance Committee today for a grilling about their progress. Their CEO Gerry Mallon, however, was not with them. Just last week it was announced that Mallon will resign from his role later this year and serve as Tesco Bank’s chief executive in the UK. Stanley told committee members there was precedent for an outgoing CEO not attending the committee. However, several members were critical of the bank executive’s decision not to appear before them. “He should be here,” Michael McGrath told him. “It’s unacceptable,” Pearse Doherty said. “I’d say it’s disgusting that Mr Mallon is not here today,” Senator Rose Conway-Walsh later told his colleagues. This was not the only criticism the committee had to share with Stanley and Arnett. It has repeatedly called out Ulster Bank for being behind the other lenders in terms of paying back and compensating its customers. Paul Stanley said the bank wished to apologise to customers and accepted that the bank had made them wait too long to get their money back. In his opening statement, Stanley acknowledged that the length of time it has taken is “unacceptable”. So far, 1,200 of the bank’s almost 3,500 overcharged customers have been paid back and compensated. It will be the end of June before all 3,500 are paid back. Sinn Féin’s Pearse Doherty described the pace of progress in Ulster Bank as “pathetic”, pointing out that fewer than 200 customers had been paid back and compensated in the month of January. Senator Rose Conway-Walsh also asked about the levels of compensation being offered, telling executives that the average for some of the other banks is 20%. Stanley said compensation offers range from 12% for a customer who was never in arrears or financial difficulty to 15.5% for those with whom the bank had engaged in legal proceedings. When asked whether the Central Bank had expressed approval of these compensation rates, he repeatedly said the regulator had “noted them”. He told Conway-Walsh that there are currently six appeals to this compensation, but 140 customers have asked for appeal packs, so more may follow. And the number of impacted customers is likely to increase, the committee heard, as Ulster Bank is currently “in engagement” with the Central Bank on other cohorts of accounts. Stanley said he could not give any time frame for these potential additions. Under questioning by Fianna Fáil TD Michael McGrath, the bank’s chief financial officer confirmed 15 customers lost their homes as a direct result of the overcharging. Six of these were voluntary surrenders and there were also two repossessions. Only one of the 15 homes has not been sold on by the bank. “If someone volunteers, it’s with a gun to their head, to avoid court,” McGrath said. Stanley said these customers all received a €50,000 upfront payment and the bank is “doing its utmost” to ensure these people can get another house. The largest cheque he has written in these cases is for upwards of €300,000. On his turn to speak, committee chair John McGuinness said Ulster Bank “has a brass neck like no other I’ve ver seen”. He said the opening statement would have people believe the bank is putting customers first but the large volume of letters TDs and Senators were receiving from their customers would indicate otherwise. McGuinness read from a number of these letters, including one from a woman who has been waiting 17 months for the bank to rectify her situation. He said she had told the bank of her personal situation, both in relation to her health and finance, in November 2016, with a further meeting in December 2017. 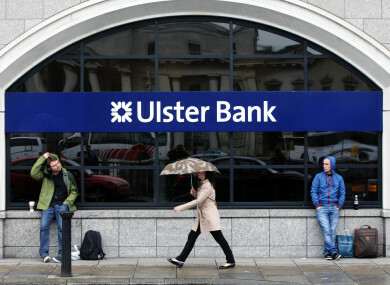 Email “Tracker mortgage scandal: Ulster Bank made €100 million by overcharging customers ”. Feedback on “Tracker mortgage scandal: Ulster Bank made €100 million by overcharging customers ”.